In the previous post in this series, we looked at some operators that take in two numbers and produce some kind of pair of numbers, an ordered pair, in a way that can be reversed. Two sets of blocks, 2 red blocks and 13 green blocks, lined up as shown. Suppose I want to find out how many blocks there are altogether. In other words, I want to add up 2 blocks and 13 blocks, or 2 and 13. I can picture this as an operator that takes the split as its input, and which produces as its output the sum, here 15. Now let’s look at the effect of the operator “move the separator” – which we introduced here – on addition. In terms of the blocks shown above, the split 2|13 can be thought of as two red blocks right next to 13 green blocks. 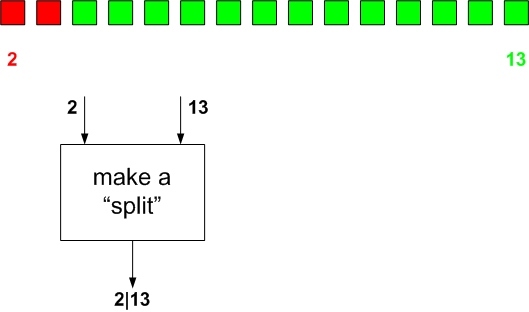 The “move the separator” operator can be thought of as the effect of painting the leftmost green block red – or imagine that each block is green on top and red on the bottom, and that the “move the separator” operator corresponds to a block being flipped upside down. Note that the “move the separator” operator produces splits that are all different, and yet each produces the same sum (15). No matter how important the differences among these splits are, from at least one perspective they all amount to the same thing: the + operator produces the same thing for each of them. A useful name for this phenomenon is to say that all these splits are equivalent with respect to the + operator. We can also say that the “move the separator” operator leaves the sum invariant. Finally, we can say that the “move the separator” serves as an enumerator that produces splits that are equivalent – though we will not deal, at this time, with the question of whether this particular enumerator will find all equivalent splits. Let’s emphasize again that when we call 2|13 and 3|12 equivalent, we only make this claim with respect to the + operator. With respect to some other concern (e.g. how far the separator is from the far left, or how far the separator is from the far right, or how close the separator is to the middle), these splits will be very different indeed. If all these splits are equivalent with respect to the sum, and I’m asked to calculate what that sum is (in other words, if I don’t happen to have a little machine lying around that acts like the + operator shown above), I am free to pick whichever of these equivalent splits I like best. In George Orwell’s famous phrase, some are more equal than others! Almost all computation is based on taking the original computation problem, and then selecting an equivalent problem that is more amenable to the computational tools available – and do so repeatedly until the computation is complete. In the next post, we’ll be looking at equivalence classes and continue these ideas. This entry was posted in Uncategorized and tagged black box, denominations, equivalence, invariants, models, representations, reverse engineering. Bookmark the permalink.